On Wednesday afternoon, the Ultimate Fighting Championship announced heavyweight Alistair Overeem (pictured) will battle Travis Browne at UFC on Fox Sports 1 1. The 265-pounders will not headline the August 17 event. 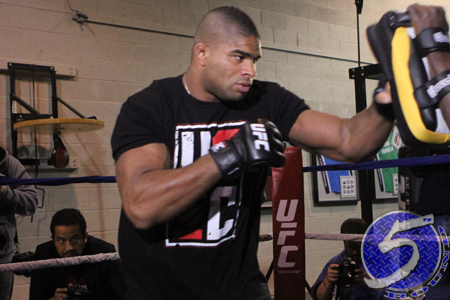 Overeem is looking to bounce back from February’s devastating knockout loss to Antonio “Bigfoot” Silva at UFC 156. It was “The Demolition Man’s” first fight after serving a nine-month testosterone suspension. Browne, meanwhile, rebounded nicely from the lone blemish on his résumé by putting Gabriel Gonzaga to sleep last month. “Hapa” lost to Silva in his prior outing. TD Garden in Boston, Massachusetts hosts the gig. FOX Sports 1 airs the main card live beginning at 8PM ET/5PM PT.